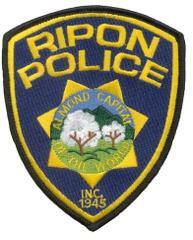 Ripon, CA - Officers from the Ripon Police Department’s DUI Enforcement Team will be deploying this weekend to stop and arrest alcohol and drug-impaired drivers in the Department’s ongoing traffic safety campaign. DUI Saturation Patrols will deploy on Super Bowl Sunday between the hours of 4:00 PM and 10:00 PM. in areas with high frequencies of DUI collisions and/or arrests. In California, this deadly crime led to 867 deaths and over 23,000 serious injuries in 2013 because someone failed to designate a sober driver. Nationally, the latest data shows over 10,000 were killed by an impaired driver. Officers will be looking for signs of alcohol and/or drug impairment with officers checking drivers for proper licensing delaying motorists only momentarily. Specially trained officers will be available to evaluate those suspected of drug-impaired driving, which now accounts for a growing number of impaired driving crashes. Recent statistics reveal that 30 percent of drivers in fatal crashes had one or more drugs in their systems. A study of active drivers showed more tested positive for drugs that may impair driving (14 percent) than did for alcohol (7.3 percent). Of the drugs, marijuana was most prevalent, at 7.4 percent, slightly more than alcohol. Everyone should be mindful that if you’re taking medication – whether prescription or over-the-counter – drinking even small amounts of alcohol can greatly intensify the impairment affects. Law Enforcement emphasizes the preventable nature of drunk driving reminding everyone that all it takes is a little planning ahead. Designate a sober driver or call a cab. But whatever you do, don’t drink and drive. The California Office of Traffic Safety DDVIP (Designated Driver VIP) mobile app is now available for free download on iOS and Android devices. Launched last year, the new DDVIP app offers enhanced features, allowing users to “Map a Spot” with their current location to find DDVIP partnering establishments in their area or a “List of Spots” to search all participating bars and restaurants throughout California. Users will be offered free incentives at each bar to celebrate their life saving role. They can stay up-to-date with the latest from DDVIP and see what other users are saying via its social tab. Also through the app, for those who want to imbibe but also make it a point to plan ahead, users can easily order a sober ride from Uber, Lyft or Curb – all from one screen. The cost of a ride home is cheap; nothing compared to a $10,000 DUI conviction and the ‘inconvenience’ of not driving your own car home is nothing compared to the inconvenience of spending time behind bars. Funding for this DUI operation is provided to Ripon Police Department by a grant from the California Office of Traffic Safety, through the National Highway Traffic Safety Administration, reminding everyone to ‘Report Drunk Driver – Call 9-1-1’.